Many firms dare to adjust Porsche engines, but not many of them venture to increase the volume. But when the German tuner TechArt starts to concern with this, he has to know very well what he’s doing. The stakes are high, at least when the good reputation of this company from Stuttgart is concerned. 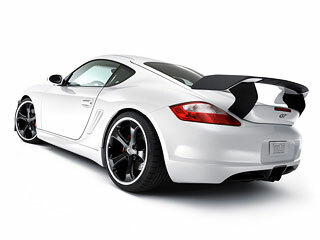 It is necessary to say that tuners from TechArt did know what to do and the result of their effort is impaired yet untasted Cayman marked GTsport. Tuners got down to exterior rebuilding and they started with the front part. A new TechArt front bumper with two pairs of headlights was stocked. It is designed in a way that it doesn’t increase the weight of front part (thanks to the carbon material). This is important at high speed. The bumper is characteristic with its four openings which insure cooling of high-power disc brakes, engine and other parts. Interesting designer‘s element that can be seen so often by this kind of cars is sharp ending of bumper on its edges. As if the car wanted to bite the asphalt.